Accrington used to be a regular affair in the pre-season, but it all ended after Robbie Blake and Steven Thompson scored to earn us a 2-2 draw in 2009. In the next two years, Accrington were forced to call the games off and it would be five years after that draw before we visited them again. That was a year ago when Jason Gilchrist scored to give us a 1-0 win, and it looks as though 'annual' might be the case again for this particular fixture. It's been well received by the home side with manager John Coleman saying: "Our friendlies against Burnley have always been good games and one which both sets of fan seem to enjoy. We have a good relationship with Burnley and were sorry to see them drop out of the Premier League but I am sure they will bounce back." We've had three games against Bradford too in the last decade or so but all have previously been away games for us. Those games came in successive years from 2007 to 2009 and the last of them was the first ever game we played as a Premier League club. Graham Alexander scored for us in that one, although we went on to lose 2-1 in a game that saw us get our first sightings of Tyrone Mears, David Edgar and Steven Fletcher in Burnley colours. 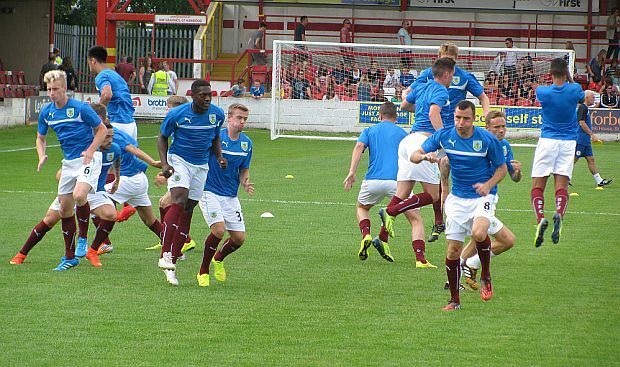 This time it's at the Turf and will be Michael Duff's testimonial. It is somewhat appropriate that they provide the opposition; back in 2010/11 they had signed Shane Duff, Michael's younger brother, from Cheltenham. It wasn't to be a long career for him there. He suffered an injury that ruled him out for a long time and in January 2012, aged just 29, he was forced to quit the game because of a spinal injury. He's since returned to Cheltenham to set up his own soccer school. Alexander was the last Burnley player to score against Bradford and now as a manager he's ready to welcome us to Highbury where the Clarets will play Fleetwood for the first ever time. It's not often the opposition manager will prove to be almost as popular as ours with the Burnley fans but no doubt this will be one of those exceptions. Grezza is rightly remembered with great affection by Burnley supporters and will remain so provided he doesn't opt to bring himself on should they get a penalty. He said: "I know Sean very well and it was something we organised a little while ago. It'll certainly be a test as they've done great over the past couple of years even though they had the disappointment of getting relegated. "We want to have stern tests in pre-season and that's what we've tried to do. We've got some really tough opponents in there this year. We're looking forward to the Burnley one and it'll be good to invite them along to Highbury for a game." There's been a suggestion that we've never played there before; that our last ever appearance at Highbury was back in December 1975 when we lost 1-0 against Arsenal in an old First Division fixture. But Burnley teams have played at Fleetwood's Highbury much more recently. Twice, in 2007/08 and 2008/09, we played reserve team games there against Blackpool who used to make use of the ground for their Central League fixtures. This was in the days when Fleetwood were in non-league and Blackpool were still some way short of being the tin pot outfit they are today. We won both those games 2-1; Alex Ray-Harvey and Alex MacDonald got the goals in the first one with the second one won with goals from Chris Anderson and James Craggs. Apart from it being freezing cold, my memory of the first of those two games is arriving to find both Steve Davis and Owen Coyle in our team whilst up and coming young players such as Chris Lynch and Wes Fletcher had to make do with a place on the bench. The second of them was memorable for a real rarity, a Burnley appearance from Remco van der Schaaf; he offered precious little. All the pre-season fixtures can now be found on the Friendlies/Key Dates paged which can be found under Fixtures/Tables/Dates within the Clarets Latest drop down menu.